It's been an amazing year and a half collaborating on stories and sharing them with you. In that time, Natalie, Lacey and I have seen both our writing and our careers grow, and with that growth, we feel it's time to move on to new challenges. We will no longer be posting collaborative stories at Tangled Fiction. We want to thank you for your enthusiasm and support as we tangled our ideas together. Your comments meant so much to us, and we hope you'll keep up with us on our personal blogs. Thank you again for helping us make Tangled Fiction a success. We will miss you. 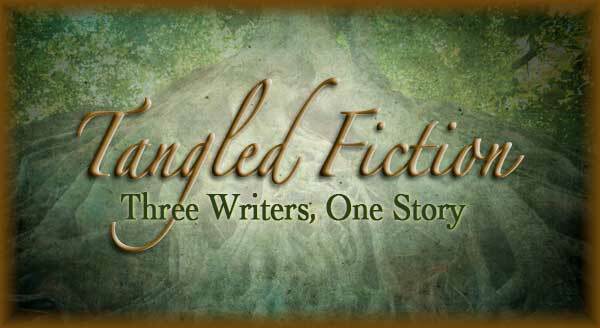 Welcome to Tangled Fiction, where three YA writers collaborate to complete one story! Every Monday, Wednesday, and Friday one TF writer will post a piece of the same story. Each of us will be responsible for one beginning, middle, and end in a single month. The fourth week will be full of surprises, we're sure, and we'll share them with you when we know what they are.